When looking at workplace safety, one thing that is often neglected is the idea of violence in the workplace. This can be a touchy subject because it can be hard to identify root causes, and you can’t really accuse people of being potentially violent without just cause. That does not, however, mean that you don’t need to address it. One of the most important things that you can do is to learn about the facts surrounding violence in the workplace so that you are operating from accurate information. Read through the following five important facts so that you will be better able to make the right decisions with regards to how your facility prepares for this risk. The first thing you need to do is recognize that violence in the workplace is a major problem. In fact, it is responsible for the second most fatalities in the workplace. In 2012, over 800 people were killed by violence from another person while at work. This is often a shocking statistic, but one that more people should be aware of. In addition to these fatalities, over 70,000 people experienced non-fatal injuries. With these types of numbers, it is quite obvious that this is a safety concern that all businesses need to address. One of the best things that a company can do to begin reducing the risk of violence in the workplace is to start talking about it more openly. Make sure people know that it is a real threat, and let them know what they can personally do to reduce the risks. Things like training or seminars on this topic can really go a long way toward reducing the danger. Violence in the workplace can have a direct impact on the productivity of employees. Of course, during and just after any violent incident there will be a major disruption of work while the issue is dealt with. This often includes police interviews, helping injured parties and other directly related downtime. In addition, however, in the months and even years after any type of violent incident, employees are often significantly less productive. According to the Bureau of Labor Statistics, over 35% of employees who were involved (even not directly) with workplace violence in the past 12 months will see a significant decrease in productivity. Absenteeism – Around 7.5% of employees in the survey reported that they missed work directly because of the violence they were involved in or witnessed. Employee Turnover – Approximately 6% of employees who were involved in this type of incident left their job within the 12 months that followed the incident. Fear Levels – Over 20% of employees who were involved in any way with workplace violence reported being fearful while at work during the year after the incident. Productivity – About 8% of employees reported that their productivity has gone down since the incident of violence in the workplace. Morale – About 21% of those who are involved will experience an overall decrease in morale. This, of course, can have negative repercussions on their overall job performance. These are just the top five ways that violence in the workplace can impact your employees. Remember, the impact to the business will continue on long after the incident is over. When trying to come up with a plan of action for preventing violence in the workplace, many companies think that the only option is to directly increase security. Things like adding metal detectors or limiting access to certain areas of the facility. While these things are certainly important aspects of improving the safety in the facility, they aren’t the only things that can help. Sometimes simply raising awareness of this risk, and alerting people to the warning signs, can do a lot to keep everyone safe. Training Classes – Providing employees with training classes can help alert employees to the risk so they know how to respond. There are many workplace security firms that offer high quality training in this area. In addition, however, the classes could be run internally using standard information. 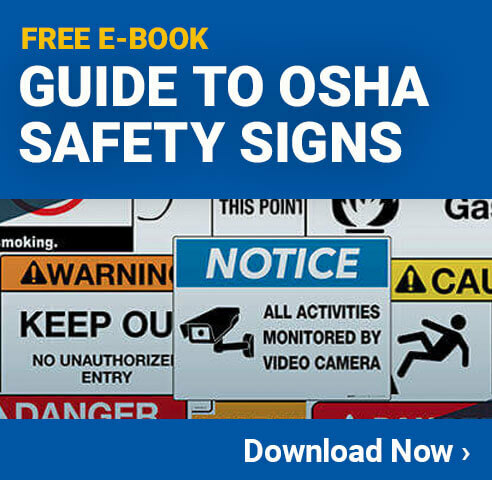 Safety Signs – Using an industrial label maker or other tools to create custom signs (similar to these) for your workplace can be surprisingly effective. Placing signs throughout the facility that reiterate the fact that violence is never an option, or giving simple instructions on what people should do if they witness violent or suspicious behavior can help in many instances. Open Discussions – Encouraging people to openly talk about the risks of workplace violence can be very helpful. These don’t have to be formal discussions, or even run directly by managers or other leaders. Simply allowing this type of discussion to take place can help people to better understands the risks so they can deal with them better. Take some time to come up with ideas on how your facility can better bring workplace violence into the open, so that it can then be directly addressed. You may be surprised at how many great ideas are discovered that could literally save lives. While violence in the workplace can happen in any job at any time, it is important to know where it is more likely to take place. The following types of jobs have been shown to have more instances of violence than most others. If you have any of these jobs in your facility, consider adding security cameras, hiring security guards or taking other steps to discourage violence. Jobs with Cash – Anytime there is cash present you are raising the risk of violence. Working with Volatile People – If you are working with or around people who are mentally unstable. This often happens when doing a job at a hospital or psychiatric facility. Working Alone – Violence is more likely to occur when there is nobody else around. Whenever possible, make sure at least three people are present at all times. Drugs & Alcohol – If working in an area where drugs or alcohol are present, the risk goes up significantly. Late at Night – Working in the evenings or overnights can increase the risk of violence. High Crime Areas – If you are working in an area where crime is already high, the risk of violence is going to be elevated. This may sound odd, but the fact is many people don’t even really have a good understanding of what workplace violence really is. Of course, everyone knows about the extreme cases such as workplace shootings, stabbings or other murders. In reality, however, most violence in the workplace is not deadly. Some examples given are anything from physical assaults to verbal abuse. Acknowledging that these types of things may not result in a fatality or serious physical injury, they are still a form of violence and will have a negative impact on the facility. Taking these threats seriously, and responding to them properly, will help to keep everyone safe and also help to avoid the situations from escalating into life threatening physical violence.